The Alien is now a Jumbo Kenner-inspired action figure! Measures a staggering 24-inches tall! Chrome teeth, mechanically activated jaws, glow-in-the-dark skull, and more. Just like the original figure - only bigger! Gentle Giant Ltd. brings you another piece of toy history with this Alien Jumbo Kenner-inspired figure. 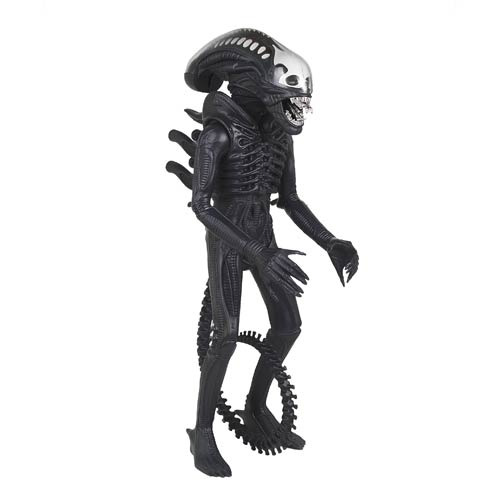 As seen on Toy Hunter, the original 18-inch tall Kenner Alien figure has been rescaled to a staggering 24-inches tall! No detail has been overlooked in this gargantuan figure that possesses the same features as the original: chrome teeth, clear dome head, glow-in-the-dark skull, mechanically activated jaws, spring-loaded arms, and movable tail! Packed in a 1979-style vintage box with a copy of the original Alien instruction sheet and poster, the Alien Vintage-Style Jumbo Kenner Action Figure is perfect for toy hunters from all generations! Ages 14 and up.